Everybody say Cheese! …Because when you discover the wonders of the cheese fondue at La Marmite in Bariloche, a picture is a must. 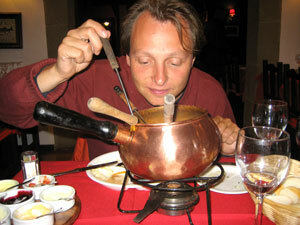 I highly recommend La Marmite for its Swiss specialties, and also just for the fun of a fondue experience. I was surprised when arriving in the town of Bariloche to see the number of restaurant options. Of course you have your Argentina asado hot spots, a Mexican restaurant for those wanting to spice things up, a vegetarian respite from the constant beef, and even a European Fondue restaurant! I had to go. As far as fondue goes, let’s just say I’m no novice. I have managed to dip my way through various fondue joints throughout the years and can easily recognize a fondue gone wrong. When the big dining night finally came around, I saved my appetite and arrived at La Marmite with high expectations. I followed our waiter through the wooden, candle-lit rooms, hardly able to contain my excitement. Other food options are available at La Marmite but the only menu I needed to see that night was the one for the wine. Our waiter took our order with a big grin and a few minutes later we were winin’ and dinin’ over a beautiful golden pot of fondue. We went all out that night. We started off with bread and veggies to dip in our cheese fondue and followed it with a full plate of meat to cook at our table and dip within our colorful arrangement of sauces. In case you have never “fondued” before, you must know that it’s not just the food that is so wonderful but also the experience. Fondue should be fun and the dipping entertainment is all inclusive in the price. If you arrive at La Marmite in a group, make sure to consider your seating chart. As the fondue rules state: if a woman drops her food into the fondue she must give the man to her right a kiss; however if the man drops his in the pot, he buys the next round of drinks. Obviously, following the rules makes for an exciting night! I was very pleased with my Argentina fondue experience at La Marmite. The food and wine were terrific, the restaurant ambiance was cozy and welcoming, and the service was worthy of a big tip.